Of all the assaults on our self image - from bad hair days to those extra pounds - none is as debilitating as bad skin. Whatever the condition is - sagging and wrinkles, redness or full acne eruption, our skin is not only the largest organ and our first line of defense against infection - it is the canvas on which all our features are displayed. We have found that many patients believe their skin conditions are irreversible or that the effort to fix them is too costly or painful. We have addressed some of the most common skin problems to show you that problems that resisted cure in the past are now effectively dealt with. 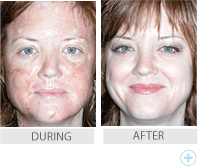 What is treatment for Hyperpigmentation? What is the treatment for dark spots? What is the treatment for facial capillaries? 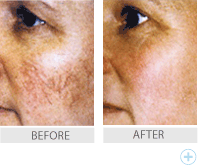 Intense Pulsed Light (IPL) Photorejuvenation is Forever Young's exciting new breakthrough service, which uses a broad spectrum of light to produce remarkable results on a wide range of skin conditions. By promoting the production of new collagen, you can reduce the appearance of common problems such as fine lines, age spots, sun-induced freckles, acne rosaceas, and broken capillaries. It can safely treat imperfections on your face, neck chest, arms, and hands. A safe, non-invasive treatment that can be tailored to the individual, there is no downtime for the procedure and it can be combined with other treatments such as Botox® and collagen.